Oksana Boyko: Hello and welcome to Worlds Apart. Politics is an art of compromise, or at least it used to be. In the current standoff between Russia and the West over the Ukraine, both sides accuse each other of intransigence and keep raising the stakes. After years of paying lip service to the non-zero sum approach, are we back to the geopolitics of all or nothing? Well to discuss that, I'm now joined by one of the world's most senior statesmen and a former Australian prime minister, Malcolm Fraser. Mr Fraser, thank you very much for being on the show. OB: Now, we are hearing a lot these days about the prospect of another Cold War, and you actually lived through the original Cold War. Do you think a re-run is possible? MF: A new Cold War is certainly possible and it's easy to cast blame or the situation that has arisen. I think NATO missed a great opportunity with the breakup of the Soviet Union. I know President Gorbachev believed he had an agreement with the first Bush administration that NATO would not move east. NATO had, after all, done it's job. But then it pushed ahead to the borders of Russia, and I can understand Russians believing that that's a provocative move. There would have been other ways, less provocative ways, of ensuring the security and independence of eastern European states. I think the West then lost an opportunity to really begin to make Russia a collaborative partner. OB: Mr Fraser, you just mentioned that those inroads into Russia's immediate neighbourhood by NATO are seen in Moscow as provocative but when Russia expresses those concerns, they are usually taken as paranoid in the West. And even if we accept them as such, as paranoid, what's the point from the western perspective of pushing a paranoid Russia to its limit? MF: I don't believe Russia is paranoid. I do believe Russia has historic interests and this was certainly a traditional area of Russian interest long, long, preceding communism and Stalin. And the United States in particular said no, this is going to become an area of western influence, of NATO influence, European influence or American influence. And I can understand Russia being greatly disturbed about this. OB: You just mentioned a moment ago that Gorbachev, Mikhail Gorbachev, was promised by NATO officials that after the collapse of the Berlin Wall, NATO expansion would essentially stop, and yet we all know that that didn't happen. Why do you think the West and NATO, in particular, have been so persistent in moving eastward, because we had almost three generations of western policy makers who have never questioned the wisdom or indeed, potential ramifications of such moves. MF: There are many people, I think, who have questioned the move west of, the move eastward of NATO, but president Clinton was determined that it should happen. He believed that putting eastern European states within NATO would be a democratising move. I can't see how he arrives at that particular logic. NATO had done its job. I think the Soviet Union, from my perspective, was a outward looking, thrusting, aggressive power. But then when it disintegrated, the West should have done everything it could to build a collaborative world, to make sure that, alright, Russia no longer had it's Soviet empire, but Russia is a very important country, how can we make sure that we can work with Russia, that Russia will want to work with us? Well, pushing NATO to the boundaries of Russia, in my view, was bound to do the opposite. OB: Now Moscow's concerns over the expansion of NATO have long been dismissed in the West as the example of the Cold War mentality, you know, that Russia still lives in the past and views the West in those Cold War lenses. And yet if we look at the current crisis and the way it was portrayed in the West, many suggested that Russia's effective control over Crimea is just the first step in Putin's expansionist, imperialistic agenda and that if he's not challenged this time around, the next day he will invade Poland, and the day after tanks may role into the Czech Republic. I wonder, how do you think we can break this cycle of mutual fears that over time turn into self-fulfilling prophecies? MF: Somehow or other, Russia and the West need to try and make a new start, a different start. I think we have to accept that what the European Union has done over recent years, what's happened in the Crimea, these things have happened. But how do we re-establish a degree of trust between the West, between NATO and between Russia? Because without a degree of trust, there's not going to be any peace and there will be a return to a cold war. Now, I could make a suggestion. The West, it seems to me, and European Union and NATO in particular, have been trying to woo Ukraine, a traditional area of Russian interest, or of concern, not over a few years, not over the period of communism, but over centuries. And they're trying to woo the Ukraine, really, to say 'we want to join NATO'. I think the Ukraine should be told that it can never join NATO, that other means will be found to make sure that the Ukraine remains secure. The West should be persuading those who are now in government in the Ukraine that within Ukraine they must learn the art of compromise. And those who are more inclined to Russia in the Ukraine, should also be persuaded by Russia – you must also learn the art of compromise. OB: But Mr Fraser you certainly cannot teach Ukraine the art of compromise without Russia and the West exercising that art themselves, and it seems that at the moment, the exchange, the political exchange between the two, is quite uncompromising, lets say so. Now, I know that just a few days ago, you published an article, an op-ed, in The Guardian in which you said that there's absolutely no way out of the current crisis, unless the West recognises some of its past mistakes that you ave already mentioned, that is, the expansion of NATO. But recognising one's mistakes is an extremely difficult thing to do. Do you think the current generation of policy makers, decision makers, in the West have got what it takes to concede some of the weaknesses of their policies? MF: Well, this might be one of the problems of the world. Where are the great leaders? Where are the great statesmen? After the world war, I think there were many people that realised that the world nearly destroyed itself. And victors and vanquished all determined to do better to try and create a safer and a more secure world, but where do such people exist today? I think that's a very real question. I don't know that we should talk about the past, or continue to. Events have moved on since that article was published a little. The referendum in the Crimea has been taken and I would believe that most people feel that Crimea, whether as an independent state, or whether it's joining Russia, is no longer really part of Ukraine. Everyone should understand, including the West, that the naval facilities, the military facilities, in Crimea were absolutely essential to Russia, and that Russia would have to take action to secure and safeguard those particular strategic interests. Now, having arrived at this point, how do we move on? And moving on does not consist of encouraging one of the major parties in the Ukraine, hosted by President Obama just a day or two ago in the White House, that that party can have it all its own way. So if both the West and Russia say 'right, we've got to try and establish the circumstances so that people in the Ukraine can live at peace with themselves'. At the moment, that's not happening. OB: Yeah, I agree with you totally. There is a saying by a famous American economist, John Kenneth Galbraith, who said once: 'politics it the art of choosing between the disastrous and the unpalatable' and I guess that describes the predicament of Russia and the West in the current crisis. Now, as far as Putin is concerned, I think he chose the unpalatable. He fully understood, in my view at least, what kind of reaction Crimea's reunification with Russia would provoke but he saw no other way of defending Russia's national interests. Now, I would like to ask you about the western position, this very hasty endorsement of the new Ukrainian authorities, including some very unsavoury elements within their ranks - the ultranationalist, far-right groups. Is it disastrous or simply unpalatable? MF: It was certainly ill-advised but this has been done. What we now have to try and do, or what Russia, I believe, and the West need to try and do if peace is to be maintained, and if there can be a degree of trust established, is to persuade both the parties in the Ukraine that they must learnt the at of compromise. The current government doesn't, to me, have a great deal of credibility because it was, really, installed after great violence and a coup from the streets. But, alright, it happens to be there. But if there could be elections across the Ukraine, properly supervised, properly monitored, across the whole country, and then you have a situation in which the European Union, the United States and Russia are all saying to those who are most friendly to them in the Ukraine itself: 'look, if you want one country, you've got to learn to live together. Take this opportunity to establish a parliament that will be your government'. And then I think you'd also need to say that Ukraine should be free to make whatever economic relationships it likes with other countries, whether Russia or the West or both, but it should not become part of a defence bloc, a military block, and therefore, as Henry Kissinger said a few days ago, it should not be eligible to join NATO. I think that would be absolutely essential to gain Russian support for such a proposal because if I were Russian, I would believe that NATO has been trying to seduce the Ukraine, although it's friendly to the West, to force the situation so that the Ukraine will become part of NATO. OB: Mr Fraser, it's refreshing to see yourself and Henry Kissinger, people we would normally describe as 'cold warriors' advocate a sensible compromise in this very difficult situation while the current generation of Western policy makers seem to be very inflexible and going for the one side takes all approach. Anyway, we have to take a short break now. When we come back, despite the chorus of Western condemnations, Russia has recognised the results of the Crimean referendum. Is this a gross violation of international law or simply history repeating itself? That's coming up in a few moments on Worlds Apart. 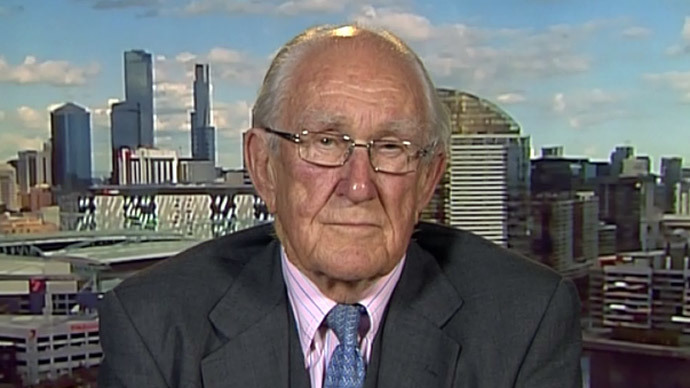 OB: Welcome back to Worlds Apart where we are discussing the tensions between the West and Russia with former Australian Prime Minister Malcolm Fraser. Mr Fraser, just to give our viewers a sense of how long you've been involved in politics, you first ran for office in 1954, that's actually the year when Nikita Khrushchev decided to, you know, hand Crimea over to Ukraine. And last week as we mentioned, the people of Crimea decided to re-join Russia and in justifying their stance, they're citing all sorts of, what they see as, international precedents in Kosovo, the upcoming referendum in Scotland and so on and so forth but the response that they're hearing from the West is that, you know, you shouldn't mic those things. What you are doing is illegitimate but what we've been doing is totally right and I wonder if you could help our viewers understand what is so strikingly different about all those examples? MF: Let me answer that this way – from the very beginning, the United States has regarded itself as an exceptional nation, as a nation that's better than all others, that has only ever gone to war to fight for the freedom of other people. Well that's not really true, if you look at American history. America feels it can break international law, that what America does is right. Rules are made for other people, for countries like Russia or countries like Australia, but whatever America does is right because America does it. Now that's in the American psyche, it's in their DNA. There's no, the worst war that, tragically, Australia supported was the invasion of Iraq and all the damage, all the civilians killed as a consequence of that – that was a total violation of international law. And so people just get up and say those things, and you'll have a lot of people in the West agreeing with President Obama simply because he says it. OB: Well, Mr Fraser, if I can put it to you – one other initiative, American initiative to some extent, that Australia has supported was in recognising Indonesia's annexation of East Timor, something that led to a very bloody war, which claimed hundreds of thousands of lives, and I know that it was primarily American support that drove that war with, you know, military supplies and diplomatic support, but your government, under your leadership, was also criticised for, well, allegedly cooperating with the Indonesian military and President Suharto. I wonder if, in hindsight, you ever came to regret that policy? MF: I regret greatly what happened in East Timor. I believe Australia acting alone would not have been able to do very much about it. You mentioned American support for what Indonesia was then doing. Now, actions of a different Australian prime minister, and East Timor is now independent, is now free. So, great powers very often, too often, interpret international law as what is in their particular interest at the time. Now, we need to try to make rules that everyone will support. If the United Nations is ever to work, great powers and lesser powers are all going to have to abide by the rules of the organisation. But it's the great powers that tend to push the rules aside when it suits their national interests. And therefore, when the United States says that what Russia has done is in defiance of international law, well, that can't be taken as gospel. The government and the change of power in Ukraine itself was surely in defiance of democratic principles. OB: Now, if I can draw one more parallel between what happened in East Timor and the current situation in Ukraine. The conflict in East Timor was born out of the Cold War dynamic because the West then feared that East Timor may become a communist country and that could be threatening to Western submarines. And I think there are some parallels with what is happening in Crimea, at least in the sense that it is also a battle for the spheres of influence and security issues, security concerns are also at play here, but of course the population of Crimea voted in favour of joining Russia but some Ukrainian politicians have already warned that it could also lead to a bloody insurgency. Maybe not on the level that we saw in East Timor, hopefully not, but do you think there's any appetite in the West to support any kind of anti-Russian insurgency? Do you think that sort of Cold War tactics are still being used these days? MF: I would hope not. I would hope the West can learn that that kind of activity does not really work, it destroys trust and might make peace between Russia and other countries quite impossible. The West should not, under any circumstances, involve itself militarily in the affairs of Crimea, Ukraine. OB: What you say is quite surprising for a western statesman, a western politician. I know that Australia is a great democracy, you're accustomed to have all sorts of debates on various issues but its surprising to me that on this particular case, on this standoff between Russia and the West, most of your politicians across the political spectrum are very unanimous in believing that it's all Russia's fault, and you're pretty much the only person of national prominence who came out and suggested a bit more nuanced approached to this issue. Why do you think the Australian political elites side so blindly with Washington? MF: Newspapers report things in certain ways. President Putin has had a bad press in the Western media for a very long while. I think some of this is deliberate, but I'm not the only one whose taken a slightly different view of events. Henry Kissinger's article, I think in the Washington Post, was also quite different from the general rhetoric that you would hear from the West. A man called Cavan Hogue, who was our last ambassador to the Soviet Union and our first ambassador to Russia, has also just printed an article which takes a reasonable, balanced, point of view quite similar to the views that I've been expressing on your programme. OB: Now, Mr Fraser you just mentioned that President Putin has been receiving a lot of bad press in the West, including Australia, and I wonder why do you think the West finds him so disagreeable? Because as it seems from Moscow, he actually, his rhetoric has been quite conciliatory. He actually, as far as I'm concerned, he tried not to spoil the relations with the West completely but for some reason he is almost portrayed in those demonic colours in the West. Why is he so disliked by Western politicians and by the Western public? MF: Western countries, Western politicians have contributed to this, have been very short sighted and have been incapable of looking at the larger picture. Whether they have played into what they think is populist sentiment or not, I don't know. But, it's very important that the West, European Union, America and Russia, and China also, all get on together and that's essential if there's going to be a peaceful world. And therefore, you don't do things that are going to create mistrust. Now, President Putin said something about the anti-ballistic missile facilities that the second President Bush wanted to place in Poland and, I think, Czechoslovakia. He claimed they were aimed at Iran. Well if I were Russian, I would say they're not aimed at Iran, they're aimed at Russia. And that I would have regarded as a hostile move compounding NATO's move to the boundaries of Russia. You've got to try and build a better world, you've got to try and built trust. And you don't do that by behaving as though a Cold War is still in place. Now, putting those ABM sites in those two countries, to me, was behaving as though the Cold War was still alive and well. Shifting NATO east, even though President Gorbachev believed he had an agreement that it should not. I think he was wrong in that but he had certainly argued for it very strongly. I think doing that was a provocation and not conducive to establishing the kind of trust and cooperation which is so necessary if there is to be a real peace and real cooperation. OB: You just mentioned China as an important player and what's interesting to me is that in your op-ed in The Guardian, you also mentioned China as the country that has been facing this policy of containment from the United States rather than the policy of engagement and cooperation that you advocate for, and I'm sure Chinese, like Russians, have increasingly less tolerance for this language of force. Do you see that as a source of potential tension, probably similar to the ones that we've seen these days over Ukraine? MF: Well, the United States speaks with two voices to China. On the one hand, they say they want strategic cooperation, they want economic cooperation, social cooperation, and on the other hand, they tighten, they strengthen their defences, from Japan south through Australia, around Singapore and even now talking of making India a strategic partner. My Chinese friends say: 'which America are we to believe? The one that talks cooperation or the one that's seeking to strengthen it's already very powerful military forces?' And we shouldn't forget, in these circumstances, that China's military expenditure is about eight percent of the world's total. America's is about 42% of the world's total. The balance of military expenditure overwhelmingly, it's American. And is that the way to build peace? America tried in Vietnam, they tried in Iraq, they're trying in Afghanistan as Russia did, and all three are going to end as failures. So, the United States hasn't come to understand that a good political outcome is very difficult to obtain through military means. OB: Mr Fraser, in just a few moments that we have left – you are one of the few remaining Cold War veterans, and you said previously that 'Those who thought the Cold War was over and who hoped for a better world are now being proved wrong'. Is it really that bad? MF: You have to be an optimist. We have to hope for a better world and leaders who will understand how to achieve it. OB: Well, Mr Fraser, one thing I know for sure is that this kind of conversation that we just had wouldn’t be possible during the Cold War. So, I really appreciate you being on the show, unfortunately we have to leave it there. OB: And to our viewers, please keep the conversation going on our Twitter, Youtube and Facebook pages and I hope to see you again, same place, same time, here on Worlds Apart.